Kidney transplantation is a cost-saving treatment that extends the lives of patients with ESRD. Unfortunately, the kidney transplant waiting list has ballooned to over 100,000 Americans. Across large areas of the United States, many kidney transplant candidates spend over 5 years waiting and often die before undergoing transplantation. However, more than 2500 kidneys (>17% of the total recovered from deceased donors) were discarded in 2013, despite evidence that many of these kidneys would provide a survival benefit to wait-listed patients. Transplant leaders have focused attention on transplant center report cards as a likely cause for this discard problem, although that focus is too narrow. In this review, we examine the risks associated with accepting various categories of donated kidneys, including discarded kidneys, compared with the risk of remaining on dialysis. With the goal of improving access to kidney transplant, we describe feasible proposals to increase acceptance of currently discarded organs. The lack of organs for kidney transplantation is a major public health problem due to its attributable mortality and excess cost to the United States health system. During the last decade, the waiting list for kidney transplantation in the United States has risen steadily to over 100,000 candidates. Unfortunately, the number of deceased donor kidney transplants has plateaued at around 11,000 per year and living kidney donation has also declined. As a result, the number of candidates added to the kidney transplant wait-list in 2013 was three times higher than the number of donated kidneys.1 Kidney transplant candidates commonly wait over 5 years for an organ in many areas, although individual waiting time depends on geography, blood type, and sensitization. Most patients receive chronic dialysis while wait-listed. Duration of dialysis is one of the strongest risk factors for death, even among patients ultimately transplanted.2 As a consequence of long waiting times, many candidates should be counseled that they have a greater probability of dying than they do of transplantation.3 For these reasons, the fact that >17% of procured kidneys were discarded in 2013 (Figure 1) requires scrutiny and new solutions. The kidney discard rate has remained high over time, especially for kidneys with KDPI >85. KDPI, kidney donor profile index. Ever-lengthening waiting times for kidney transplantation have been mirrored by a rising percentage of patients with inactive status (referred to as status VII), meaning that they are ineligible for transplantation.4,5 One third of kidney transplant candidates are currently inactive. While the high percentage of inactive patients was driven by an Organ Procurement and Transplantation (OPTN) policy change in 2003 (allowing candidates to accrue wait-list priority whilst being classified as status VII), the rise in inactivity may also be driven by health deterioration during dialysis.6 Longer dialysis time leads to greater rates of cardiovascular events, infections, and other complications that render patients temporarily or permanently unable to undergo transplantation. In summary, as the disparity between supply and demand for transplantation has worsened, many patients never receive transplants, and some suffer considerably worsened health by the time transplantation occurs. Expanding access to kidney transplantation will require centers and their patients to accept kidneys that present different types of risks. These risks can be placed into two categories: graft failure and transmissible disease. Figure 2 shows that a substantial percentage of kidneys transplanted in 2013 were not from standard criteria donors. A substantial percentage of kidneys transplanted in 2013 were not from standard criteria donors. Top panel: KDPI >85%; Lower panel: KDPI <85%. 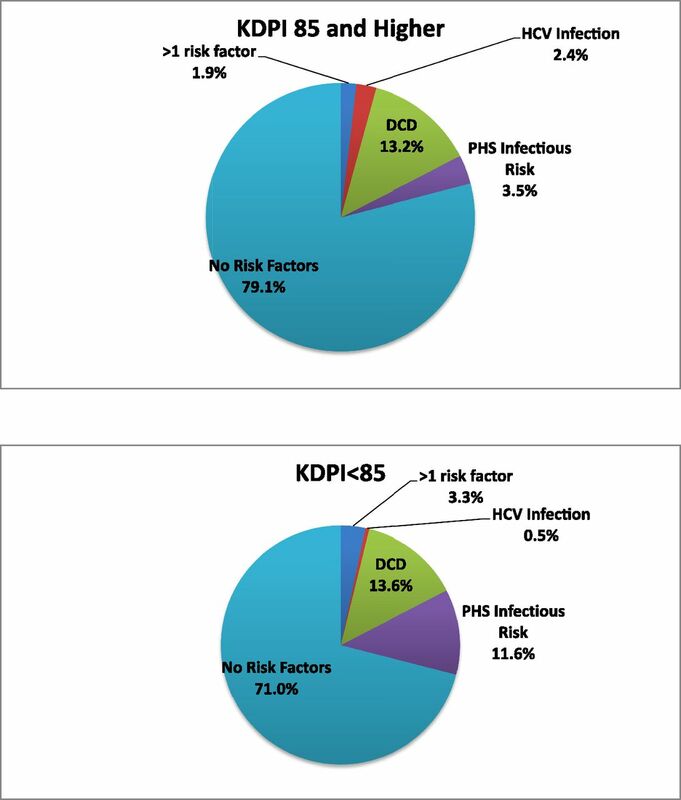 KDPI, kidney donor profile index; PHS, public health service; HCV, hepatitis C virus; DCDD, donation after circulatory determination of death. Most patients probably understand that many choices, such as buying a car, require simultaneously considering several options with distinct risks and benefits. However, when a deceased donor organ is offered, the choice is to accept that transplant or continue waiting with uncertain information about the timing and quality of future organ offers. Until recently, kidneys with a low risk of graft failure were categorized as “standard criteria.” Kidneys with elevated graft failure risk due to older donor age, hypertension, elevated terminal creatinine, or death by cerebrovascular accident were designated as expanded criteria donor organs.7 Organs from donors after circulatory determination of death (DCDD) are also considered nonstandard given elevated rates of delayed graft function, although graft survival has thus far proven to be nearly as good as for standard criteria donor kidneys.8,9 Although such favorable outcomes may, in part, reflect careful selection of DCDD organs, many currently discarded organs would almost certainly provide a favorable risk-benefit ratio to some wait-listed individuals. With the new kidney allocation system, these binary categories have been largely supplanted by the kidney donor profile index (KDPI).10 The KDPI incorporates ten donor characteristics (including age, terminal creatinine, and hepatitis C virus [HCV] serostatus) into a score from 0% to 100%.11 For example, a KDPI of 85% implies that the kidney’s graft failure risk is higher than for 85% of the reference population of kidneys. Similar to earlier policy with expanded criteria donor kidneys, transplant candidates must provide additional consent to be offered kidneys with KDPI≥85%. The rate of 2-year graft failure is about 9% for kidneys with the lowest (i.e., best) KDPI scores and rises linearly to about 29% for the highest KDPI donors. In contrast, the probability of kidney discard sharply increases as the KDPI nears 60%, as shown in Figure 3. However, the very high discard rates for kidneys with high KDPI scores may not be warranted. Increasing Probability of Discard as the KDPI Rises, with 95% CI. KDPI, kidney donor profile index; 95% CI, 95% confidence interval. The C-statistic (a metric of predictive accuracy) of the KDPI for graft failure is approximately 0.6.12 A C-statistic in this low range demonstrates that the KDPI frequently generates incorrect predictions about post-transplant outcomes.11 There are multiple potential explanations for the KDPI’s modest ability to forecast graft failure.13 First, the formula relies heavily on donor age, although there is wide variation in renal function within individuals of the same age.14–16 Second, donor terminal creatinine may underestimate the quality of kidneys with acute injury. Third, the KDPI does not include HLA matching data. Additionally, because new HCV therapies have high cure rates, the KDPI may not accurately forecast outcomes for HCV-positive kidneys in future years. The lack of accurate methods to assess kidney quality probably explains some of the wide geographic variation in kidney discard rates (Figure 4). This variation suggests that organs considered too marginal in some regions would be transplanted in others. Studies are needed to explain this variation. Once differences in practice patterns are better understood, there may be important opportunities for programs that achieve good transplant outcomes using lower-quality organs to advise other programs about best practices. 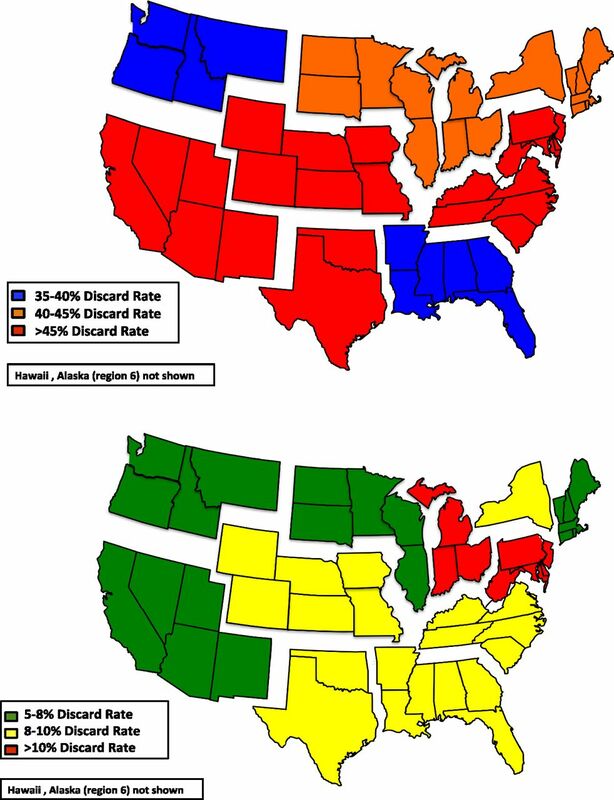 Geographic variation in discard rate by organ quality in 2013 (top panel: KDPI >85%; lower panel: KDPI <85%). KDPI, kidney donor profile index. Center Report Cards: A Disincentive to use Higher-Risk but Viable Kidneys? United States transplant centers receive report cards on quality twice a year. Every death and allograft failure after transplantation is analyzed for quality lapses and published on a publicly available website (www.srtr.org). Centers with poor risk-adjusted outcomes will face penalties from the OPTN. These centers often receive additional scrutiny from Medicare or private payers. These events create great stress and consume substantial resources because center staff must prepare extensive data to respond to audits. Report cards should promote quality. However, nearly all report cards focus on effectiveness – that is, how patients survive and function after they receive care. Report cards commonly ignore other key elements of quality, such as whether a center promotes equitable access to transplantation by accepting a reasonable proportion of kidneys offered to them. Some donated kidneys truly cannot help potential recipients, and ought to be discarded. For example, some kidneys have damaged vessels or present infection or cancer transmission risks that compromise quality in ways not reflected in the KDPI. It is also uncertain which currently discarded kidneys would have similar outcomes to accepted kidneys with the same KDPI. However, report cards exacerbate the existing scarcity of usable organs because centers perceive that more liberal acceptance of organs or sicker patients will put their outcomes at risk.32,33 A bad report card threatens a center’s financial viability, because payers cancel contracts and patients leave.31 Additionally, recipients of lower-quality kidneys have more complications and cost the center more to transplant. The focus on post-transplant survival in these reports may also deter innovation, because risk-adjustment models struggle to keep pace with scientific advances. For example, if a center pursues innovative treatments like desensitizing patients to antigens present on kidney allografts, the center’s outcomes are not adjusted for that procedure.34 Yet, the use of desensitization actually serves as a marker for broader acceptance of donors or recipients, because centers that do not perform this procedure are less likely to successfully transplant some patients with very elevated panel reactive antibodies. While report cards may cause centers to be excessively cautious, this “stick” may be a smaller problem than the lack of “carrots” to motivate centers to accept more organs. If the risk-benefit ratio of accepting kidneys were more favorable, many more patients could be spared years of dialysis (Table 2). Higher-risk kidneys would be rescued from discard. The initial group of remedies would reduce the cost to centers of accepting a lower-quality kidney. First, payers should develop tiered payments according to organ quality. Any transplant center should achieve good outcomes by accepting only kidneys from 20-year-old donors, but a center that accepts a 68-year-old kidney will likely need to expend more resources to achieve that same outcome for its recipient.9 Therefore, a center that transplants a high KDPI kidney should be rewarded with higher reimbursement. Alternatively, a center that accepted a high KDPI kidney could be offered additional priority when the next kidney is offered. Another approach would be to encourage centers to transplant two lower-quality kidneys into one recipient; these recipients usually enjoy additional years of good kidney function.35 Because we can predict which kidneys are at high risk of discard,11 the OPTN could change allocation so that more high KDPI kidneys are rapidly offered as a pair to single recipients. Currently, only 2% of donated kidneys are transplanted as dual organs.36 This proposal might only generate a small number of additional transplants, but would increase survival for patients who received them. The second set of remedies would change report cards so that they do not disincentivize aggressive acceptance of kidneys. For instance, post-transplant outcomes could exclude data from patients who received the highest KDPI kidneys. One criticism of this remedy is that, due to thorough risk adjustment, outcomes for patients receiving high KDPI kidneys do not usually cause bad center report cards.37 However, this criticism rests on the assumption that current risk adjustment – based on outcomes for kidneys accepted in the past – are sufficient to predict outcomes for currently discarded kidneys. Additionally, even if center reluctance to use high KDPI kidneys is based on a flawed understanding of risk adjustment, removing some high KDPI kidneys from report cards might still encourage greater utilization of these kidneys. An alternative approach is for the OPTN to adopt a complementary metric of a center’s organ acceptance rate. The organ acceptance rate is calculated by dividing the number of organs each center accepts by the number offered to that center’s patients that are ultimately accepted somewhere. This metric would be adjusted for kidney quality and patient comorbidities. Centers that transplanted greater proportions of patients might therefore avoid penalties despite worse than expected survival rates. This dual-reporting approach may be particularly valuable at centers with virtual monopolies on the local ESRD population. Currently, these centers can afford to refuse all but the highest-quality organs.33 The OPTN has developed a proposal for the organ acceptance rate metric, which is out for public comment.38 Unfortunately, this proposal (entitled the “Composite Pre-transplant Metric”) has paired the organ acceptance rate with a second measure – the center’s transplant rate. The problem is that the transplant rate will be inversely proportional to the proportion of potential transplant candidates that a center chooses to list. If graded on transplant rates, centers may not add vulnerable patients to the wait-list, thereby making their numbers look better but reducing access to transplantation. For this reason, the organ acceptance metric should be implemented alone. The third approach would focus on fast-tracking high KDPI and PHS infectious-risk kidneys to centers that are likely to accept them. For example, the OPTN could identify centers with a record of achieving good outcomes with these organs. In the following year, these centers would get enhanced access to these organs through prioritized offers, reducing cold ischemia time. A complementary strategy would be to leverage the competitive nature of transplant professionals with public recognition of centers who accepted a high rate of lower-quality organs. This recognition could be an elite status that is reported on public websites, perhaps accompanied by supplemental Medicare funds. Notably, the new kidney allocation system promotes regional sharing of high KDPI kidneys, but early analyses of this system suggest that discard rates have not decreased.39 This finding lends support to the idea that wider sharing of kidneys is not enough to increase organ acceptance; instead, allocation must direct organs to centers likely to accept them. General nephrologists have a fundamental role to play in facilitating access to transplantation by promoting the acceptance of donated kidneys. First, they can counsel patients that all treatment options for ESRD, including dialysis, involve risk. Transplantation with high KDPI or PHS infectious-risk kidneys often reduces mortality risk compared with continuing dialysis. Second, when communicating with transplant centers, referring nephrologists can help to identify which wait-listed patients are willing to consider nonstandard kidneys and likely to benefit. In some cases, they may also request information about whether the center turned down any kidneys offered to these patients. General nephrologists should develop expertise with managing complications such as delayed graft function that commonly accompany the use of high KDPI and DCDD kidneys. A total of 17% of procured kidneys from deceased donors are discarded, despite evidence that some of these kidneys could benefit wait-listed patients. This review outlines a range of proposals to increase organ acceptance. These proposals pose some challenges. Although the use of lower-quality organs serves a public health purpose by promoting transplant access, some patients may experience complications that would not have occurred had they instead waited for a standard organ. Outcome measures such as the organ acceptance rate will require statistical refinement. Ongoing review will be needed to ensure that an undue proportion of lower-quality kidneys are not allocated to vulnerable groups, such as less-educated patients. Changing consent procedures would also require rethinking the basis for ethical informed consent in transplantation. However, the added value of a second consent may be very limited under the time-pressured situation where organ offers are considered. Compared with the current situation, where many donated kidneys are discarded, these risks seem like a reasonable tradeoff to achieve transplant’s benefits. By embracing effective incentives, the field of transplantation can recalibrate its approach to risk and bring kidney transplant to more people who need it. Dr. Reese is Chair of the Ethics Committee for the United Network of Organ Sharing. His efforts were supported by the Greenwall Foundation. Dr. Abt is Co-Chair of the Ethics Committee of the American Society of Transplant Surgeons. Dr. Halpern is a member of the Technical Advisory Committee to the Scientific Registry of Transplant Recipients, and of the federal Advisory Committee on Blood and Tissue Safety and Availability. Dr. Harhay’s efforts were supported by a K23 grant from the National Institute of Diabetes and Digestive and Kidney Diseases (grant no. DK105207-01). The views expressed in this essay are the authors’ own, and do not necessarily reflect the views of these organizations or the US Government. The authors would also like to acknowledge the advice of John Friedewald, Richard Formica, and Darren Stewart in providing data and feedback related to the effects of the new kidney allocation policy on organ discard. The authors also thank Vishnu Potluri for help with analyses. : Outcomes of kidneys from donors after cardiac death: implications for allocation and preservation. Am J Transplant 7: 1797–1807, 2007.